Wallpaper for a rural retreat or a city space. 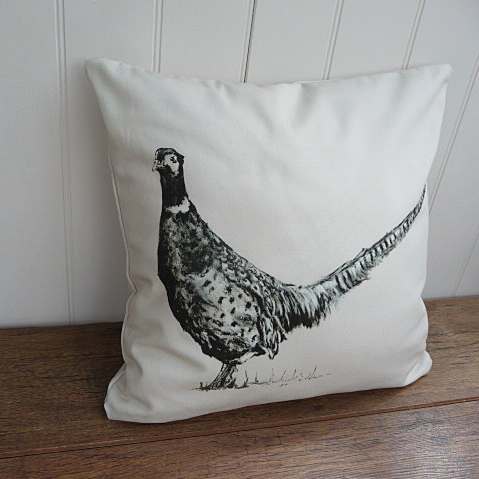 A stunning large scale Pheasant design in a statement symmetrical pattern. Shown in the Pink, please contact should you require a sample for a true colour match. Ex Vogue Living Editor, Vanessa Barneby graduated from Edinburgh University in 1999 and went on to study decorative painting, trompe l’oeil and restoration at Hampstead Decorative Arts in London. Her passion for furniture, textiles and print led to a position as an interiors stylist at House & Garden for 5 years. From 2004 until 2009 Vanessa was the Living Editor at British Vogue where predicting and writing about upcoming trends in design, styling shoots, and examining the correlation between fashion and interiors were all part of her job. A fellow Edinburgh graduate, Alice Gates went on to study figurative painting overseas before achieving a Masters in Fine Art at The City & Guilds of London Art School. Her vivid, often narrative paintings, rooted in fashion illustration, have been exhibited worldwide and featured in numerous publications including Vogue, Tatler and The Saturday Times Magazine. She has also collaborated with the fashion label Libelula, designing prints for their ready-to-wear collections.